Update: Broadcast date for Season 3 announced! Just a few more months! Original cast and staff are back in this new season with Studio Deen handling the animation and MOKA is responsible for the soundtrack! :D Looking forward to it! Takahashi Misaki is suddenly having some unexpected and odd problems. What started as a need for some college entrance exam tutoring has somehow led him to being romanced by a suave older man who also happens to be his older brother’s best friend. Confused by all of his brand new emotions, Misaki struggles to deal with his suddenly very odd life. And if that wasn’t enough, his suitor, Usami Akihiko (Usagi-san), has plenty of issues of his own. A man-child who decorates his room in giant teddy bears and toys, Akihiko is a famous novelist who also writes steamy boys’ love novels on the side. When Misaki cracks open one of these books and reads sentences like “Akihiko licks every inch of Takahiro’s hot body”…and Takahashi Takahiro happens to be Misaki’s older brother’s name… all hell breaks loose! The last episode in season 2 ended in 2009 and it sure took them long enough to finally continue the anime. I’m glad! No other details provided but I’m quite sure they’ll go with the original animation house, etc. Available with Junjo Romantica Vol. 16 manga. 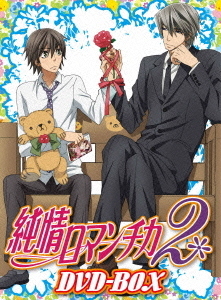 Junjou Mistake 純情ミステイク, a spin off manga about two side characters Asahina Kaoru (Okiayu Ryoutarou 置鮎龍太郎) and Isaka Ryuuichiro (Morikawa Toshiyuki 森川智之) from Junjou Romantica will be made into an anime! Episode 1 (Usami x Misaki) XD SOoOOo Cute! I think the animation improved cos the movements seem smoother and more fluid. The wait is not in vain. Awesome episode ^^ YAY JUNJOU! The characters and animation were smooth and expressive, with many different facial expressions and camera angles which makes it rather engaging to watch. The backgrounds and enviroment scenes were also varied and beautifully painted too ^^ You can see that the animation was created with care and not “cheap” looking. The humour came across quite nicely and chibis were cute. The pace of the story was just right and did not detract from the original. The H-scene in the first episode was kind of subtle (but then again maybe not *sweat drop*) and if you’re not familiar with the manga, you may not even catch what really happened LOL~ It was yummy ;) and non-BL fans will -definitely- freak out at all the other BL scenes as well. Ah~ But what a treat for BL fans! The voice casting was spot-on as expected hehe. Yay~ again to a great start! (^_^) A definite must watch! This anime series is based on BL manga by Nakamura Shungiku 中村春菊 ^^ The first episode was aired in Japan on 10 April 2008. 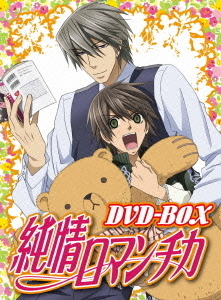 BL Anime: Junjou Romantica DVD Release!